Appearance: Dark copper with thin sticky legs. Nose: Oak, toffee, allspice, crystallized ginger, lavender, tarragon. On the palate: A little thin, but silky like those boxers your girlfriend got you for Christmas. Caramel, oak, sugarplum, mace, peppermint. Finish: Dry. Oak, mint and alcohol fading into a sweet tingle. Parting Words: The 2000 vintage of Evan Williams Single Barrel was the first to be distilled at the newly revamped Bernheim distillery in Louisville. Heaven Hill’s original distillery (and several warehouses) burnt down in 1996. The label was redesigned for the 2000 vintage so it’s very easy to distinguish between pre-Bernheim and Bernheim vintages. Since this is a single barrel product, there will be some variation between different barrels. Heaven Hill does a very good job of picking barrels with similar profiles in a given “vintage”. Judging by barrel 440, 2000 is one of the best, on par with the pre-fire vintages 1994 & 1995 and the “in exile” vintages 1997-1999. It is perfectly balanced between oak, caramel, spice and herbal tastes and aromas. This a very enjoyable whiskey. The only knock on it is the usual knock on this series: the proof is too low. In spite of that handicap, this is still top notch. 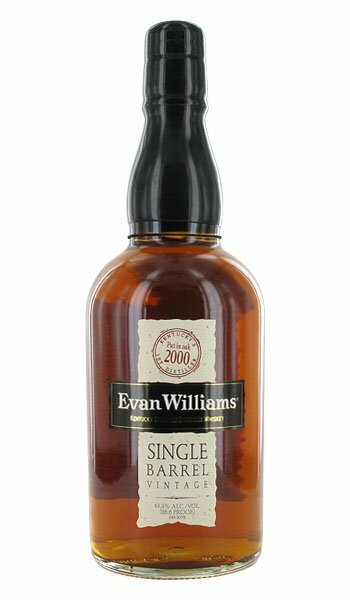 Evan Williams Single Barrel, 2000 vintage is highly recommended. Note: Since this is a single barrel product, there will be some variation between different barrels. That said, Heaven Hill does a very good job of picking barrels with similar profiles in a given “vintage”.